Over time there are certain niche classic cars that get left behind and forgotten and then suddenly begin to gain in popularity. One such niche which for many years was forgotten, but has been gaining steam in recent years is the classic full-size station wagon market. Two signs that the station wagon has finally come of age in the classic car market are their skyrocketing prices (for pristine examples) in recent years and their appearance in larger numbers at car shows. Where only a few short years ago, if you found a nice conditioned 1960s, 1970s, or a 1980s full-size station wagon (with no rust and car show quality) with even low mileage, the price tag was under $5,000. They were great bargains, after-all a full-size rear-wheel drive classic V8 powered American car in good rust-free condition for under $5,000 was as good as it got. Unfortunately not anymore, if you want a nice good condition original spec wagon from the classic era, expect to at least pay close to $10,000 – many are over $10,000 and a some very pristine examples are over $20,000. They are catching up to the the mint conditioned 1950s wagons which are usually over $20,000. Another factor in their appeal is that there aren’t that many of them left on the roads. Most led utilitarian lives where they were family haulers that racked up lots of miles and eventually ending in the automotive graveyard. In fact many of these full-size 1960s and 1970s station wagons were equipped with large displacement V8s (needed to haul around their hefty weight) so it came as no surprise that they were scrapped for their large displacement V8s. For instance most have heard all the numerous stories in the last 20 years of the dirt cheap full-size station wagon listed in the local paper for a few hundred bucks only to be bought by someone looking for an inexpensive large displacement V8. This method was a cheap way to get a good large displacement V8 for less money than the average core engine block price for that particular V8. Once pulled from the old station wagon the V8 could then be easily built up as a serious performance motor that would make its way into a muscle car or performance car. The rest of the station wagon was usually scrapped for parts or sent to the boneyard. The net effect was the needlessly destruction of perfectly good station wagons on a wide scale, making them very hard to find now. A good number of these scrapped station wagons were in good condition, and even a minority of them were even in car show type condition, but their age and poor demand, meant they were worth only a few hundred dollars for many years. Fortunately with their recent value in dollars rising, the remaining stock have a better chance of surviving than the ones already lost. By the late 1970s, the Corporate Average Fuel Economy (CAFE) standards kicked into high gear and the full-size station wagons had lost their large displacement V8s. Most made do with around 5.0 liters of displacement. Where during the decade before many of the full-size wagons had displacements between 6.6 to 7.5 liters. The plus side was nobody was going to cannibalize a 1980s wagon for a 5.0 liter V8. Even so with the 1980s being three decades ago, many station wagons have disappeared from the roads. The 1980s was the last hurrah for wagons, it was the last time they would sell in large numbers. GM would offer its full-size wagon lineup through the 1996 model year and then they would disappear forever. By the late 1980s minivans had overtaken in sales the traditional full-size wagons, which spelled their eventual demise. However for those looking to enter into the classic car market, yet want a full-size V8 powered car that can haul around five to eight people comfortably and provide plenty of cargo space, a 1980s station wagon may be just the ticket. 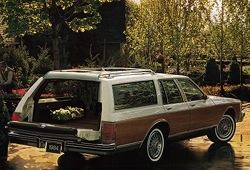 And nobody offered a wider selection of full-size wagons for the differing customer tastes than GM during the 1980s. Out of the four full-size wagons GM produced during the 1980s, the Pontiac wagon was the most removed from its fellow marque brethren. The Pontiac wagon didn’t really fit into the "We Build Excitement" credo most of the other cars in Pontiac’s lineup adhered to during the 1980s. Pontiac had an identity crises with its full-size car lineup during the 1980s. It started off the 1980 model year with the base-level full-size offering being the Catalina and the more luxury oriented full-size version being the Bonneville. This carried over to the 4-door wagons where Pontiac offered the less expensive Catalina Safari and Bonneville Safari. The Catalina Safari (base price $7,362) was an entry level full-size wagon whereas the Bonneville Safari (base price $7,958) was the higher trim level for those wanting a little bit more luxury appointments than what was found on the Catalina Safari. The upside to ordering these wagons was Pontiac’s 140 horsepower 4-bbl 4.9 liter V8 was standard. This may not seem like a big deal today but back in 1980 this was a good horsepower rating. The standard engine on the (coupe and sedan versions of the) Bonneville and Catalina was a 110-115 horsepower 3.8 liter V6. The 4-bbl 4.9 liter (301 CID) V8 was also standard on the 1980 Trans Am. However it wasn’t the horsepower that was the big deal it was the 240 lb-ft torque rating of the 4.9 liter V8 that gave the Catalina Safari and Bonneville Safari good pulling power at the lower rpm range – just what a customer was looking for in a station wagon. And if more horsepower and torque were needed a 155 horsepower (280 lb-ft of torque) Buick 5.7 liter (350 CID) V8 and a 160 horsepower (275 lb-ft torque) Oldsmobile 4-bbl 5.7 liter (350 CID) V8 were available on both wagons. During this era diesel motors were the craze, so it came as no surprise a 105 horsepower Oldsmobile fuel-injected 5.7 liter (350 CID) diesel V8 was also on the option list. Inside both versions of the Safari there was plenty of space, with a 116 inch wheel base up to 6 full-size adults could fit very comfortably shoulder to shoulder in both the front and back seating areas with plenty of leg room. There also was plenty of headroom. An optional flip-up rear cargo area bench seat which could seat two full-size adults increased the interior seating capacity to 8 passengers. The two passengers sitting in this third seat row were positioned towards the rear window, in other words the seating position was backwards. Anyone who grew up during this era will remember these reverse positioned third row seats in station wagons, which was where most kids wanted to sit. For 1980, Catalina Safari total production was 2,931 units and the Bonneville Safari was 5,309 (which equated to a production total of just 8,240 for both). Not exactly high numbers. The reason was full-size cars across the board (by the 1980 model year) took a massive hit after the second oil crises in 1979 which had sent fuel prices skyrocketing. As an example for 1979 Catalina Safari production was 13,353 and Bonneville Safari production was 16,925 (which was 30,278 total – about 5 times what total 1980 production was). 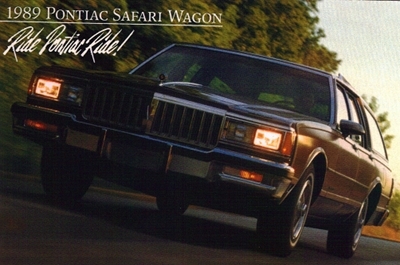 Pontiac rolled into 1981 continuing to offer both the Catalina Safari and Bonneville Safari. Sales saw a very slight bump of 16% with production of the Catalina Safari at 2,912 and the Bonneville Safari at 6,855 (9,767 was the total production). The big news for 1981 was the 301 V8 was dropped for both wagons, the Oldsmobile 4-bbl 5.0 liter (307 CID) V8 rated at 145 horsepower was now standard on both wagons. Unfortunately the Oldsmobile 5.7 liter diesel V8 returned as an option on both wagons – this engine was notorious for extremely slow acceleration times and poor reliability. Even with the slight uptick in full-size car sales in 1981, Pontiac threw in the towel for 1982 and dropped its entire full-size rear-wheel drive car lineup in the U.S. market. The Catalina name was retired, while the Bonneville moved to the mid-size rear-wheel drive GM G-body platform. A Bonneville wagon was on the option list but it was no longer a full-size wagon. Pontiac dropping its full-size car offerings was a bold move especially since no other GM division dared to make the move in 1982. Pontiac had thought their full-size cars would not be missed and that the full-size market would not recover after the 1979 fuel crises. Unfortunately they were wrong, full-size cars by 1983 were seeing a major upswing in sales. Unfortunately Pontiac had nothing to offer them. So Pontiac towards the end of the 1983 model year offered American buyers the full-size 1983 Pontiac Parisienne which was Pontiac’s full-size car available in the Canadian market. The Parisienne was built on the same GM B-body platform that the previous full-size Bonneville and Catalina used. Even though it was a late model year release buyers responded favorably towards the Parisienne. 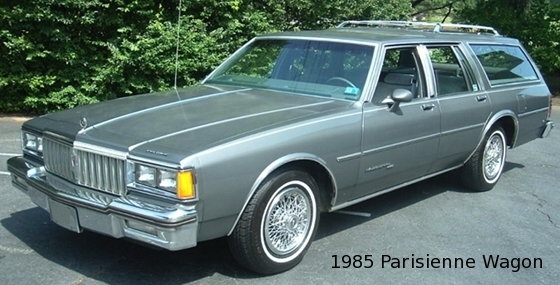 The little secret was the Parisienne was based on the Chevrolet Caprice – the only exterior differences between the 1983 Chevrolet Caprice and the 1983 Parisienne were the front grille and taillights. Buyers didn’t care they were just glad to have a full-size Pontiac back. 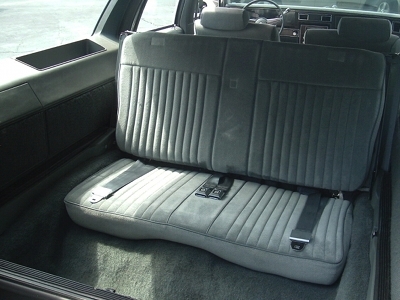 Fortunately the Parisienne interior was different enough from then the Caprice, so it could at least have a little semblance of its own identity. The good news for Pontiac buyers who wanted a full-size wagon, the 1983 Parisienne wagon was added to the lineup when the Parisienne 4-door sedan made its first appearance in the American market. 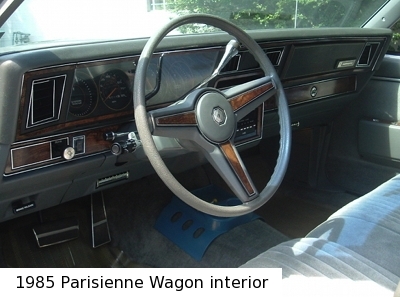 And just the like 4-door Parisienne, the wagon’s exterior was essentially a Chevrolet Caprice wagon and the interior was more Pontiac (except for the dash design/layout which was taken from the Caprice). The comfort and interior space and even the reverse direction third row seat was there as was found in the previous Catalina Safari and Bonneville Safari. The Parisienne wagon which had a base price of $9,927, was a success even with its late model introduction, it managed to sell 3,027 units in the U.S. which was 17% of total Parisienne sales in the U.S. The bad news was a 110 horsepower Buick 2-bbl 3.8 liter (231 CID) V6 was standard in all 1983 Parisiennes including the wagon. The good news was there was an optional 145 horsepower (250 lb-ft of torque) Chevrolet (LG4) 4-bbl 5.0 liter (305 CID) V8 available on both the 4-door and wagon versions of the Parisienne. And like a bad penny that keeps returning, the 105 horsepower Olds 5.7 liter diesel V8 was also on the Parisienne option list. The 1984 Parisienne wagon was a carryover from the 1983, even the engines carried over with the same three available engines with the same horsepower ratings. Parisienne sales skyrocketed, with wagon sales accounting for 16,599 units – the best full-size wagon sales since 1979 and 27% of 1984 Parisienne sales. Indeed full-size car sales were on the rise, since many Americans still wanted large rear-wheel drive cars. For 1985 the only changes were the Buick 3.8 liter V6 was dropped and replaced with a 130 horsepower Chevrolet fuel-injected 4.3 (243 CID) V6 as the standard Parisienne wagon engine and the LG4 5.0 liter V8’s horsepower rating increased to 165. The 4.3 V6 was a Chevrolet 5.7 (350 CID) V8 with two cylinders chopped off. The bump in horsepower was welcome since the Parisienne wagon weighed in at a hefty 4,095 lbs. 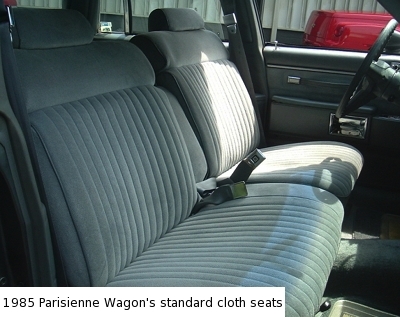 The bottom line on the 1985 Parisienne wagon, was that with a reasonable base price of $10,945 sales climbed slightly to 17,638 units. Not bad when you consider the full-size Pontiac wagon had been around with only minor exterior and interior cosmetic changes since 1977. 1985 would be the last year for the Oldsmobile diesel V8 option on the Parisienne. The Parisienne wagon was a easy money generator for Pontiac, it didn’t spend any money on development of a replacement and just sat back and collected cash from happy buyers. The full-size GM B-body platform was on borrowed time by 1986, GM was performing a divide and conquer approach concerning phasing out the GM B-body. For 1986 Oldsmobile and Buick lost their full-size rear-wheel drive B-body (2-door and 4-door) sedans which were replaced by all-new smaller front-wheel drive cars. The only reason GM was continuing full-size rear-wheel drive B-body production was that the Chevrolet Caprice was selling in very large numbers, even for 1986 which was its 10th year of production with the same general body style, sales were a whopping 245,012 units (45,183 of these were Caprice wagon sales). When Buick’s LeSabre and Oldsmobile’s 88 went to the front-wheel drive GM H-body for 1986, GM decided due to the absence of H-body wagon variants, it would keep producing rear-wheel drive B-body Oldsmobile and Buick station wagons virtually unchanged through the 1990 model year. Strong Caprice sales during the remainder of the 1980s forced GM to spend money on a vastly redesigned Caprice which debuted in 1991. 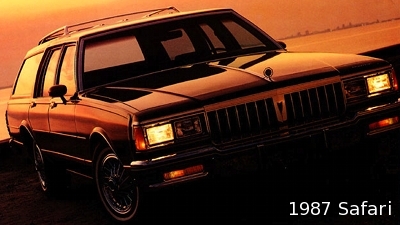 The Caprice wagon would also get a big redesign for 1991. Buick and Oldsmobile would also get radically redesigned rear-wheel drive wagons for 1991. For 1991 Buick would get a new rear-wheel drive 4-door sedan B-body variant but Oldsmobile would not. Pontiac was completely left out of the equation in the 1991 B-body redesign. Now for a quick rewind back to 1986, which would be the last production year for the Parisienne. Total Parisienne production was 85,082 units (14, 464 of these were wagons), with numbers like these the 4-door sedan Parisienne could have stayed on for a few more model years if Pontiac had desired. However Pontiac was getting a brand-new H-body front-wheel drive Bonneville for the 1987 model year and felt it was big enough to entice Parisienne buyers. However Pontiac did continue to produce the full-size rear-wheel drive wagon for the 1987 to 1989 model years, virtually unchanged from the Parisienne wagon – only the name had changed to Pontiac Safari and the base price had increased from $11,779 of the previous year to $13,959. Even with the 16% price increase sales were still strong at 13,154 units for the 1987 Safari. For 1987 the Oldsmobile LV2 4-bbl 5.0 liter (307 CID) V8 was mandatory for the Safari, it was rated at 140 horsepower and 250 lb-ft of torque. For 1986, the LV2 had made a mid year arrival on the Parisienne (so both the LV2 and LG4 were available in the wagon for 1986). The LV2 would continue as the Safari’s only available engine during the remainder of the Safari’s production life. When production ceased for the Safari at the end of the 1989 model year, no one really paid any attention. No automobile magazine provided editorials or stories bemoaning the death of the full-size Pontiac station wagon. In most writers minds it was an extinct dinosaur that had lived long beyond its prime – like a 60 year old NFL quarterback. Even with little respect, Pontiac had no trouble selling out their 1989 Safari inventory before the 1990 model year began. And that was no easy feat after 13 production years of the same overall body style the Safari by 1989 having a pricey $15,659 base price, it should have had the appeal of 2 week old donuts. 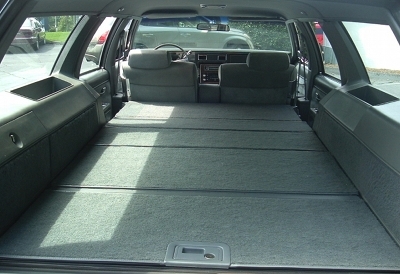 What buyers got with the full-size 1980s Pontiac wagon was something that worked – it was 100% utilitarian. The Pontiac B-body wagon provided reliable transportation with a very spacious interior cabin and an attractive exterior. And the buyers that recognized this in the 1980s just wouldn’t let the full-size Pontiac wagon die. However to merely summarize this wagon in this fashion would be like visiting the Empire State Building and never going to the top floor observation deck. And if you don’t believe me, then the next time you watch those classic 1980s movies take a closer look at the cars used by the main characters. Upon closer inspection you’ll be surprised at how many 1980s GM and Ford full-size station wagons were used, especially in those movies portraying typical suburban life. The reason is that these wagons transcended the utilitarian stereotype and were truly a staple of 1980s suburban existence. As time passes the 1980s full-size wagons that survive the automobile graveyard or the crusher, are destined to become classics. It may take another 20 to 30 years, but that time will come. 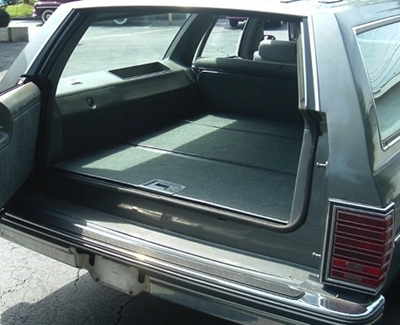 When that day arrives the full-size 1980s Pontiac station wagon will receive the honor it deserves.